Szechuan Spicy Fish Filet bowl brims with red peppers. When Ying Liang came from Beijing to join her businessman husband in Fort Mill, she missed the tastes of home. Americanized Chinese food is easy to find around Charlotte, but not the bold Szechuan flavors she loved. So on a trip back to Beijing, she recalls, “I went to my favorite restaurant and talked with the chef, Mike Lee. Would you come to America?” Remarkably he said yes. In March 2015, after seven years of planning and construction, Mrs. Liang opened Lee Cafe. 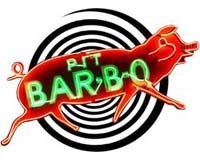 It’s a humble place next a Food Lion grocery, two stoplights away from the Carowinds fireworks outlet stores. At first glance the menu seems standard U.S. Chinese — eggrolls, sesame chicken. But turn to the back and you’ll find four pages of real Chinese specialties. 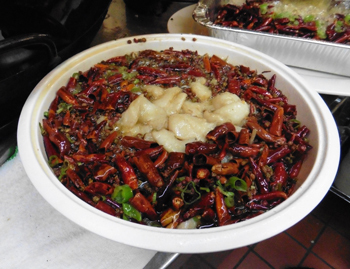 Chef Lee’s dishes offer subtle red pepper flourishes from the Szechuan and Hunan provinces. He is joined by Chef Au Bu Chen, cooking in the milder Cantonese tradition, and Chef Fang Chen who focuses on vegetarian offerings. Best way to explore is with a friend or two or three. Food arrives on platters built for sharing and you spoon a bit at a time onto your plate with some rice. Be sure to order something from the “Chinese Green” section — tender snow pea tips or cute little Chinese broccoli. 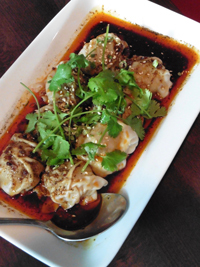 Then try the Szechuan Wonton stuffed with shrimp and pork in a zingy red pepper sauce. Or comforting Mapo Tofu with ground pork. We’re definitely going back for the zesty Eggplant with Garlic Sauce. Chef Lee’s showpiece is Szechuan Spicy Fish Filet. A broad bowl brimming with dried red peppers arrives at the table with broth still bubbling from the wok. Push the peppers and peppercorns aside to pluck out the succulent — not super-spicy — bits of fish. 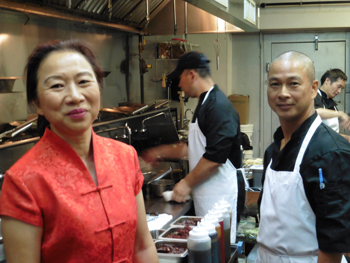 Owner Ying Liang in the kitchen with chefs Mike Lee, Fang Chen and Au Bu Chen. Monday 11 a.m. – 3 p.m., 5 p.m. – 9:30 p.m.
Wednesday – Friday 11 a.m. – 3 p.m., 5 p.m. – 9:30 p.m.
Saturday – Sunday 12 noon – 9:30 p.m.
Szechuan Wonton stuffed with shrimp and pork in a zingy red pepper sauce.